The Eccles School offers coursework in many formats, from day-time to night-time and weekend classes. We currently offer MBA Online and MSIS Online degrees, as well as online Executive Education classes where students complete the entire curriculum in an online, interactive format. The Eccles School Master of Science in Information Systems (MSIS) Online program offers business education with a practical slant, delivered in an interactive, highly accessible online format. Industry-driven coursework and opportunities for hands-on experience prepare our graduates for leadership positions in one of the fastest-growing job sectors in the world. In fact, the U.S. Bureau of Labor Statistics forecasts a 15 percent growth for employment in the IS/IT industry from 2014 to 2024. What can you expect from the David Eccles School of Business MBA Online program? Cutting-edge business knowledge, taught by some of the nation’s most highly regarded business and academic leaders. Check out the program ranked #14 in the world, and see how the MBA Online program is an investment that pays dividends in personal and professional growth. Executive Education online programs provide world-class training and certifications in lean operations, finance, marketing, strategy and more from top Eccles School faculty. Learn at any time from anywhere and take your career and company to the next level. Are you taking an online course this semester? 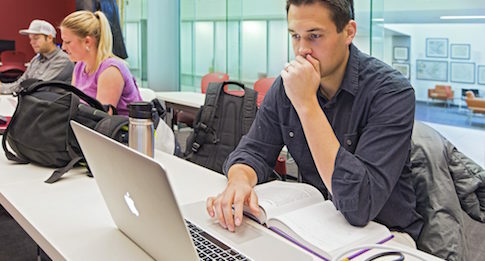 Check out the helpful resources below for information on getting starting and succeeding in online learning in the David Eccles School of Business. Check Technology – Make sure you have the basic computer specifications, a good internet connection, a web cam and microphone (internal or external) and a current browser. Log into Your Class – Be sure to log into your class on Canvas at least a week before your class starts to familiarize yourself with the course material and expectations. Assignments may be due the first week of class! Read the Syllabus Carefully – Open the detailed PDF syllabus to view all of the details of the course. It will be your responsibility to know what’s in the syllabus! Check the Course Daily – Log in each day so you stay up-to-date on any announcements or changes. Set a Schedule – A big part of successfully completing an online course is setting and sticking to a schedule! Set aside time each day or week to devote to your online coursework. Stay Connected! – Participation is a key element in online classes – make sure you identify what you need to do to participate in your class. Set your Canvas notifications so you never miss any class information. 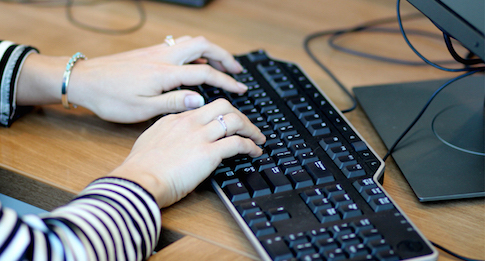 Do Your Homework – Online courses have something due every week, so stay on top of assignments. Utilize the course calendar in Canvas to sync your due dates to your personal calendar. Lecture Videos – Lectures are pre-recorded and designed just for you. Closed captioning and transcripts are available for all videos, and many include copies of course notes or lecture slides. Modules – Online courses are organized by modules and weeks as a way to help you easily navigate the course content and stay up-to-date with assignments for each week. You can access modules in the left navigation or via the “Weekly Navigation” box on the home page. Navigating the Course – Get to know your way around the course – weekly modules can be found via the left-hand navigation menu, or in the text tables on the home page. Live Webinars – Some online courses use a live video conference led by the instructor. Professors may use this time to discuss cases, talk about assignments, conduct group activities, or answer students’ questions. Exam Proctoring – To maintain the integrity of the online courses, most major exams are proctored. Exam proctoring is available at campus testing centers or online, depending on what the course requires. For more information about proctoring, check out the exam information on the UOnline site. Stay Connected! – Please add your profile picture to allow your classmates to “see” you. Take it a step further, add profile information to let others know more about you. Get class notifications when and how you want them delivered to you. You also can add additional contact methods (email addresses or your cell phone number to receive text messages). If you are not sure how to do something on Canvas, check the Canvas Guides first (scroll down to the question you are looking for answers to). If you can’t figure it out, or there is a technical issue, Report a Problem while on the page with the issue. Access the Help link using the question mark icon in the lower left corner of Canvas. A ticket will be sent to the University of Utah tech support first, and if they can’t figure it out, they will forward on to Canvas to solve the problem. Or call the university support team at 801-581-6112-option 2 (M-F 8 a.m.- 5 p.m., US Mountain Time Zone) or email classhelp@utah.edu.